This interesting surname has two possible ancient sources. Firstly, it may be of pre 8th century Anglo-Saxon origin, and derive from the locational name Badham, a minor place in the West Midlands of England. The translation is from the personal name 'Beada', plus 'ham', a homestead or hamlet. Secondly, it may be a Welsh form of the given name 'Adam', with the prefix 'ab' meaning 'son of' and equivalent to the Scottish 'Mac'. 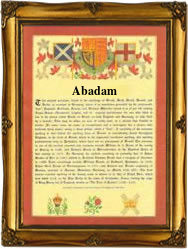 Adam was not recorded in Britain before the Norman Invasion of 1066, being introduced by the Crusaders on return from the Holyland. The original surname is 13th Century (see below), whilst variations include Badam, Baddam, and Abadam. Church recordings taken from the official registers include the marriage of Mary Baddam to George Hunter on August 1st 1597 at St. Mary Abbots, Kensington, and the christening of Alice Badham on March 1st 1584 at Upper Arley, Worcestershire. On May 20th 1735 in the reign of King George 11 of England, Josiah Abadam married Ann King at the church of St Katherines by the Tower (of London), whilst on October 4th 1739, Josiah Abadam, believed to be his brother, married Susan May at St Dunstans in the East, Stepney. A Coat of Arms granted to the nameholders, has the blazon of a gold field, on a red cross, five gold knights spurs. The crest is an eagle displayed with two silver heads charged on the breast with a red saltire. The first recorded spelling of the family name is shown to be that of Hoel de Adam, which was dated 1255, in the 'Hundred Rolls of Shropshire', during the reign of King Henry 111, known as 'The Frenchman', 1216 - 1272. Surnames became necessary when governments introduced personal taxation. In England this was known as Poll Tax. Throughout the centuries, surnames in every country have continued to "develop" often leading to astonishing variants of the original spelling.